o doubt about it…the North Cascades require more all-around mountaineering and route-finding skills than any other mountain range in the contiguous U.S. This and their incomparable scenic splendor make them my favorite mountains. In the summer of 1953, I climbed Mount Rainier with my sister and several others, hiring a guide to take us to the top. I was 16 at the time. Rainier was my first summit, other than nearby Pinnacle and Unicorn Peaks, climbed the previous week. I soon realized that climbing would allow me the freedom to be who I wanted to be and cast aside the rigidities I felt in an Eastern existence. Up until this point, I had never seen any mountains, except for the Catskills in New York State, where I grew up. I can’t remember that the Catskills made any impression upon me. For most of the summer of 1954, I visited my newly married sister in Alaska, where a busy summer job gave me no time for my new-found passion: climbing. 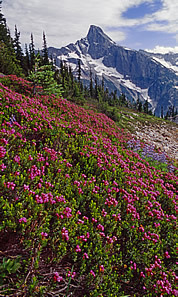 My summer adventure would be to climb Washington state’s Mount Baker before returning to the East Coast for college. Mount Baker has a higher percentage of ice cover than any other peak in the contiguous U.S., including Mount Rainier, making it an attractive destination for climbers. Adventure I got, but not of the type I expected. The trip was a crash course (pun intended) in North Cascade Brush 101, which quickly escalated into North Cascade Brush 401. Similarly, North Cascade Weather 101 escalated into North Cascade Weather 401. After arriving in Seattle in late August, I took a bus to the town of Glacier, walked to a nearby campground, and set up my small tent. I couldn’t find anyone interested in climbing Mount Baker. I was met with responses like, “Why should I climb it? I didn’t lose anything up there.” Enthusiasm for the mountains was wasted on such people. The weather was cool and overcast, with occasional rain (not unusual for late August in the North Cascade Mountains). Deferring to the weather, I decided to climb—as a warm-up exercise—Church Mountain, which was near my camp. The summit, at 6,315 feet, represented almost a 5,000-foot elevation gain from where I was camped. A trail even went to the top. Dark-looking clouds that were forming didn’t bother me in the least; I was practically unaware of their meaning, and to paraphrase Cheech and Chong, I thought to myself: “I don’t need no stinking trail.” That’s too easy. Instead I will shortcut the trail and forge a direct line to the summit right from where I am. After all, how difficult can a minor summit in the North Cascades be? Bad mistake! I had forgotten my map and compass, which I had read that you should always carry, but that didn’t matter because I would be back before dinner. Although my tremendous enthusiasm was carrying me quickly upwards, I was learning in earnest the realities of bushwhacking at the lower altitudes in the North Cascade Mountains. I made the acquaintance of slippery logs and Devil’s Club in the soggy forest, and downward pointing vine maple and slide alder in the clear areas. Soon I emerged from the trees into alpine country. The cool snow and beautiful meadows I had dreamed of all year surrounded me. The views were quickly disappearing, however. In their place began a quiet, steady rain. I gained the summit ridge, but it was long and level. A compass and map would have shown me on which end of the ridge a Forest Service manned lookout was located. There I could have gotten help locating the trail back down, although the upper portions of the trail would still have been covered with snow from the near record snowfall the previous winter. After wandering aimlessly for a while, and finding no trace of the trail or the lookout, I decided to descend the same way I had ascended. By now I was soaking wet, all the brush was soaking wet, and I was disoriented to the point that I couldn’t recall which side of the ridge I had ascended. Everything looked the same in the gray mist. For the first time in my life, I became really scared. I had not even thought of telling anyone where I was going. I flipped a coin to decide which side of the mountain I would descend—the wrong side would have, at the very least, made me spend a night out in the open in unfamiliar surroundings. I had read somewhere that the best course of action when lost is to follow a watercourse until reaching something, presumably civilization. Up there on the steep mountainside, however, this course of action seemed to be getting me into trouble. I continued descending, shortly finding myself in a watercourse. As it became steeper, I climbed out of it, only to find myself descending into another one. The brush alongside the creek was nearly impenetrable. I followed the creek down to where it joined the original watercourse. The walls were very steep and I soon found climbing out impossible and descended on steep, wet, moss-covered rock. At one point I fell about 20 feet into a large pool. The torrent swept me down. Ten feet from an additional 40-foot drop I grabbed a log, where I spent five minutes in the chill water, recovering from the shock of realizing what had nearly happened. Now I was totally drenched and numb from the cold, had torn clothing, numerous cuts and bruises, and was bleeding. The air was cold and the sky darkening. I kept pushing on and finally staggered out onto the road in the last light of day. By great good luck, and definitely not mountaineering skill, I had descended the correct side of the mountain. A kind motorist stopped to give me a ride, perhaps thinking from my appearance that I had been the victim of some kind of attack, perhaps by a bear. He left me at my camp, where I licked my wounds. Deciding that discretion was the better part of valor, I headed home, leaving the climb of Mount Baker for the following year. I learned and never forgot several very important lessons that have served me well over the years. Never, ever, take a shortcut unless you are absolutely sure it is safe, and never, ever, underestimate a climb and the effect of changing weather on your situation. Since that time, I have had incredibly good luck with the weather in the North Cascades. Only twice in my many trips into the North Cascades over the years has bad weather assaulted me. Once was during the Memorial Day weekend in 1958, when I camped at Cascade Pass (at that time, no restrictions dictated where you could camp). But that was my fault because, although the weather forecast had not been good, I chose to ignore it. The other time was on Glacier Peak in 1991. I was bivouacked with a terrific view of the Scimitar Glacier, not far below the summit. In the morning, I could see very dark clouds moving in on the southwestern horizon. In my assessment, I could climb to the summit and return to timberline and the trail before the storm overtook me. Returning from the summit, I felt the first drops of rain at timberline, and was a drowned rat upon reaching my vehicle. My good fortune with the weather came from carefully monitoring weather reports and my own knowledge derived from reading weather signs in the cloud formations. 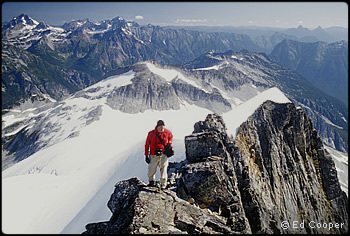 Jim Nelson, Mike Swayne, and I did an east to west traverse over the Northern Picket Range in 2001. We didn’t traverse all the peaks, but we did climb Mount Challenger along the way. The most likely time for good weather is in July, the time of our trip. Jim and Mike arranged to be ready to go on a moment’s notice when I determined that the weather window had arrived. When I sensed that the time had arrived, I called Jim and Mike and we met at the parking lot above Ross Lake the next day to begin the trek. On the sixth day, amid clear signs of worsening weather, we arrived at the parking lot at the head of Ruth Creek, where a vehicle had been left for us. Not more than an hour later the heavens opened up with a heavy rainstorm, an especially strong one for the month of July, ending our perfect weather window! I think of the North Cascades as ranging from Glacier Peak to the Canadian border peaks, and my favorites are the Pickets. The Cascade Pass area was a close second until it became too crowded. Here is a story that current climbers will find hard to believe. Walt “Buck” Sellers and I, on the last weekend of July 1958, made the first traverse of the 1-1/4 mile long Mount Torment-Forbidden Peak ridge. Get this: on a summer Friday night in a campground near the end of the Cascade Pass road, with perfect weather, we were the ONLY people in the campground. We saw no one else the whole weekend, not even after returning to our cars to leave. The area is so crowded now that rangers must do traffic control at the end of the road on busy summer weekends. One of the most enjoyable adventures of my life was the north-to-south traverse of the Southern Picket Range via the north face (buttress) of Mt. Terror in 1961. This trip had everything, including the legendary brush. I look back and realize how lightly we took the adventure, both figuratively and literally. Basically we carried day packs with bivouac gear and a minimum of food. Four of us (Mike Swayne, Charlie Bell, Dave Hiser, and I) looked at topo maps and plotted our route…let’s see, we’ll just go up Stetattle Creek, climb up and over the Elephant Butte Saddle, traverse into the northern cirque wall of the Southern Pickets, traverse hanging glaciers to the base of Mount Terror, climb up and over Mount Terror, and then descend the southern side near Goodell Creek until we come out on the road near Newhalem. What could be simpler than that? Well, plenty, as we were about to discover. The Stetattle Creek “trail” didn’t really exist after the first mile or so. We got separated and spent many precious hours trying to regroup. At the end of the forested area we came across a “clear” patch, caused by winter avalanches rumbling down from above. This area was “clear” only in the sense that we could now see the sun, and consisted of intertwined vine maple and slide alder over a base of moss-covered rocks. We could not see what we were stepping on because the brush was so thick. We decided at this point to start up to the Elephant Butte Saddle. World-class brush crashing followed for the better part of a day. Maybe our decision to rappel down the eastern side of Mount Terror wasn’t the best. The idea was that rappelling would make it easier to avoid a barrier that blocked access to Goodell Creek. The rappels were among the most exposed I have ever made. We returned to the cars hungry, out of food, and sorry this great adventure was over. And the weather? Perfect. In fact, in all of my six trips into the Pickets, the weather was good. Sadly, Walt "Buck" Sellers, my companion on a number of trips to the mountains over the years, passed away in July of this year. He appears in one of the accompanying images. He was a true lover of the mountains in every sense, introducing many others to the delights of the high country. He will be missed by all who knew him. 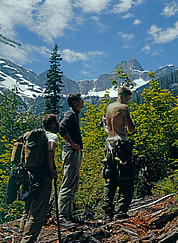 Fred Beckey and Don Gordon (on flake) on the first ascent in June 1960. Climbing on the steep NE face and north ridge of Mt. Baker in May 1957. Shuksan's Hanging Glacier on the first ascent of the NW Couloir in July 1957. Sunset on Mt. Challenger and the Challenger Glacier. Jim Nelson shading his camera lens, with clouds pouring over a section of the ridge. Mike Swayne is on the left. Panorama from Luna Ridge in 1990. Carrying a pack loaded with a 4x5 camera and all the associated gear, I climbed up to Luna Ridge by myself, a rather risky venture to undertake solo if anything went wrong. Mike Swayne on the traverse into the northern cirque wall. The brush-filled McMillan Creek Valley may be seen below. A rappel over ice cliffs during the traverse of the cirque to the base of Mt. Terror. The North Face as seen from Frenzelspitz in September 1961. A panoramic view of the peaks east of Mt. Terror, seen from the north face of Mt. Terror, July 1961. Two separate images were patched together to create this panorama. One of the most perfect pyramidal-shaped peaks I have ever seen. At the western end of the Southern Pickets, the slabby 3,800-foot west face is a sight to behold. Seen on my first trip to the area in April 1958 from Sahale Arm. Walt "Buck" Sellers at bivouac site on the first traverse in July 1958. We went light, using daypacks for all our gear. I have been to this spot twice, once in 1958 and the second time in 1991, where I spent the night at this terrific viewpoint. Forest fire smoke, looking somewhat like the mushroom cloud of an atomic bomb explosion, seen from Glacier Peak in July 1991. Mt. Baker is on the left and Mt. Shuksan is on the right. Fred Beckey approaching the NW Face on July 14, 1959, on the way to a first ascent of the face on the following day. Many of the early photos were 2 ¼ x 2 ¼ transparencies shot on Ektachrome E-3. This film, which was phased out in 1977 and replaced by Ektachrome E-6, has a nasty habit of fading quickly. Further, many of these older transparencies developed two kinds of mold or fungus. As a result, red spots and green specks can cover large portions of the transparencies. Light streaks and scratches also develop on many of the older transparencies as a result of years of handling. To restore a single transparency to its former glory can take me four hours or more. First scanning the transparency, I then work with the digital file — removing spots, scratches, etc, and then restore the original colors. None of the photos shown here have been published before, but all are scheduled to appear in the third book in the Soul of the Heights series, which is about the mountains of Washington State and scheduled for release in the fall of 2009.